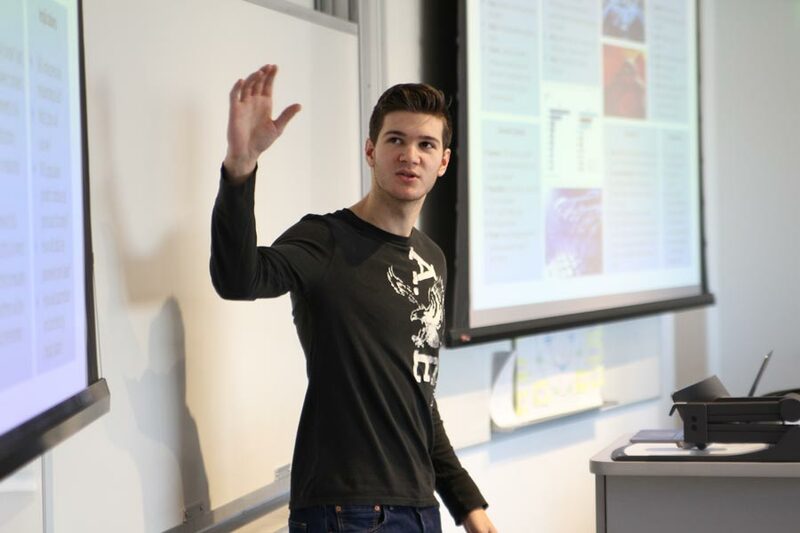 Many courses throughout the fall 2018 semester culminated in capstone or final projects that focused on innovation, creativity and problem-solving. The following is a sample of student project highlights from courses around the Dietrich College of Humanities and Social Sciences. Every fall, seniors in the Ethics, History & Public Policy major research and propose ideas to enhance everyday life for Pittsburgh residents. Joel Tarr, the Richard S. Caliguiri University Professor of History, taught this year’s capstone course, which examined the severe impact of landslides on Allegheny County. Their presentation for the Allegheny County Conservation District covered prevention and mitigation policies, insurance and litigation information, responsibilities of homeowners and the city, and impacts of climate change. Seniors in the Global Studies Capstone completed independent projects that drew from their coursework and interests. With guidance from Assistant Professor of History Emanuela Grama, they explored Japan’s economic policies and their impact on women, post-colonial political violence in Morocco, the chemical industry in post-war Western Germany, Chosonjok return migration to South Korea and the rise of transnational families, and female friendship in film. Students in the Department of Statistics & Data Science’s Corporate Capstone course taught by Rebecca Nugent, associate department head and director of undergraduate studies, presented posters about their projects for Black & Veatch, an engineering, procurement, construction and consulting company; Principal Financial, a global financial investment management and insurance company; and C.H. Robinson, an international third-party logistics and supply chain management provider. Project topics included characterizing incidents to minimize workplace injuries and regime modeling to predict future stock market behavior. Cluster, a Chrome extension that allows users to aggregate messages from a variety of platforms, including email and social media. Event Scribe, a mobile app that turns physical event posters into digital calendar events with a snap of their camera. RSVP’d, a web-application that motivates your friends to commit to and attend events while providing organizers with tools for better prediction and event management. Students investigated the impact of landslides in Allegheny County. Pictured bottom row (L-R): Allison Guzman, Jonathan Rodrigues, Joel Tarr, Paige O’Riordan and Will Chang. Pictured top row (L-R): Makenzie Donaldson, Alex Jackson, Jelani Parrish, Brett Randall and Amaya Taylor. Five seniors completed independent studies on topics across five continents. 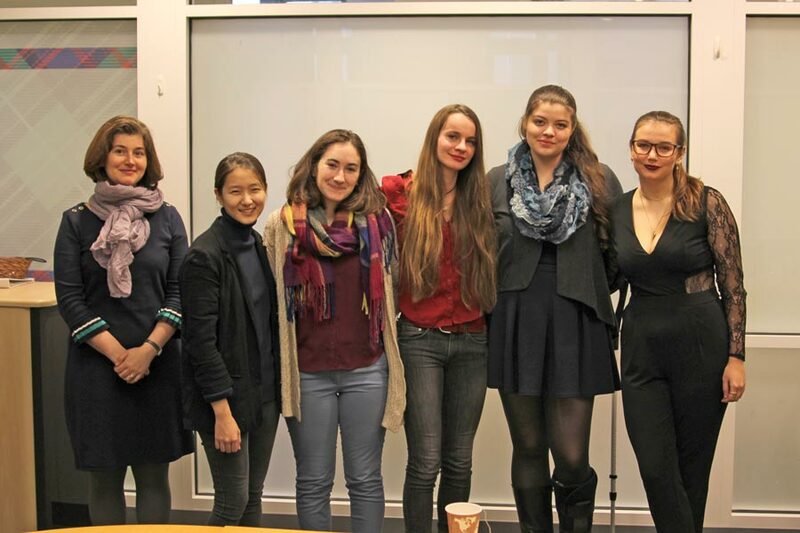 Pictured (L-R): Emanuela Grama, Diana Yuh, Sarah Boyle, Vera Schulz, Maggie Mertz and Autumn Armega-Finger. Students conducted research projects for clients including Black & Veatch, Principal Financial and C.H. Robinson. 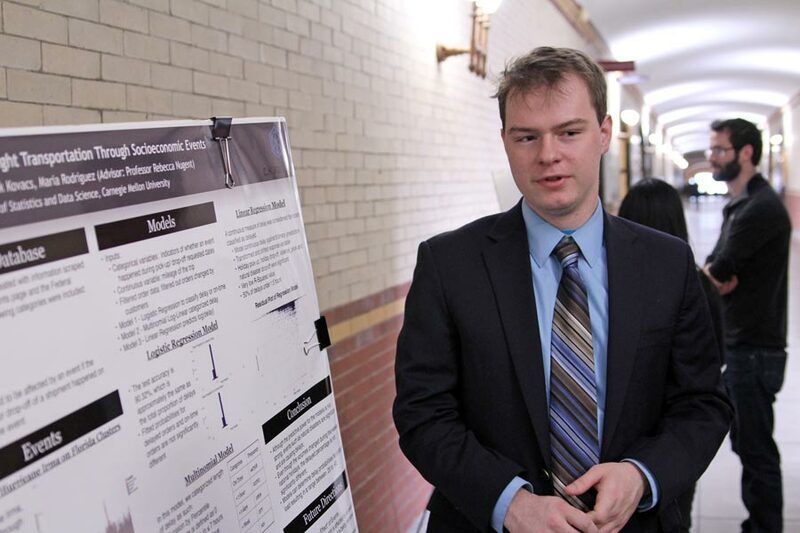 Pictured: Senior Francis Kovacs presents his research. Information Systems alumni mentors from Deloitte worked with students as they identified real-world problems or business needs and used structure tools to develop app-based solutions. 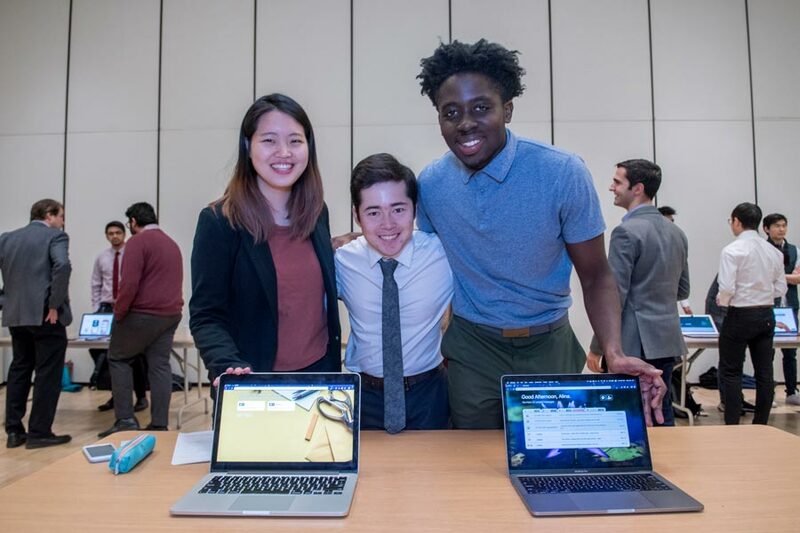 Pictured (L-R): Alina Yu, Dylan Hyun and Obed Appiah-Agyeman, creators of Cluster, which took home the “Next Big Startup” prize. Information Systems alumni mentors from Capital One engaged with students as they developed mobile apps in iOS. Capital One also awarded $1,600 in prizes to the students at their project showcase. 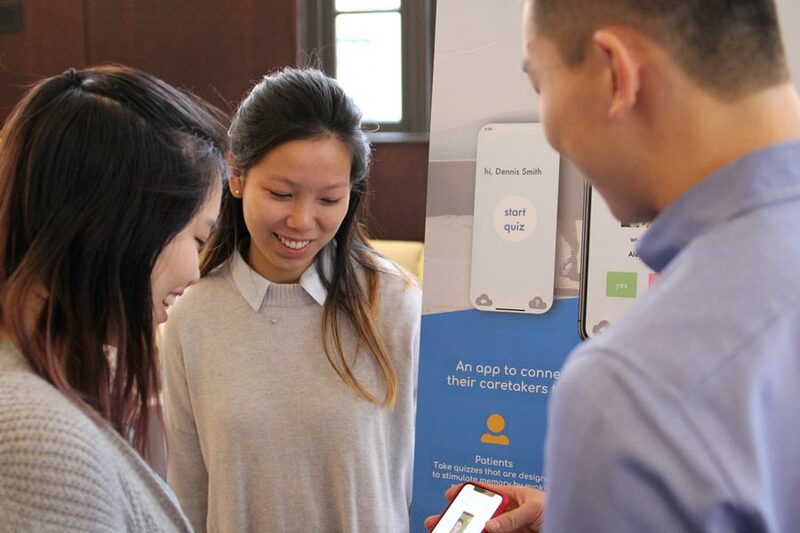 Pictured (L-R): Alina Yu, Stephanie Pang and Alec Lam explore Thoughtful, an app that connects early onset Alzheimer’s patients and caregivers with custom photo memory exercises. Student teams presented multidisciplinary analyses of the challenges and opportunities provided by current or near-future technology, as well as technology and/or policy recommendations to respond to their potential negative impacts. 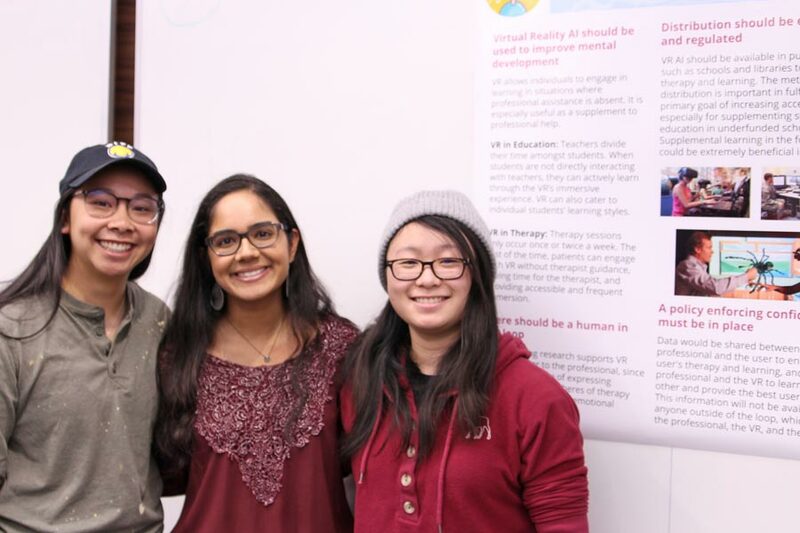 Pictured (L-R): Caitlyn Low, Shruti Murali and Joyce Wu pose with their final project, which analyzed possible uses of AI, coupled with virtual reality technologies, to provide individualized education and therapy. Information Systems alumni mentors from Capital One were on hand as students in Information Systems’ Mobile Application Development in iOS course presented their final projects. The students developed and demonstrated a variety of apps, ranging from tools to reduce food waste to a virtual caddie that uses machine learning to help golfers improve their performance. Through the course led by Teaching Professor Larry Heimann, students developed a strong understanding of the Swift programming language, mobile-centered design and technical quality in software development. Capital One awarded $1,600 in prizes. David Danks, the L.L. Thurstone Professor of Philosophy and Psychology, created the AI, Society and Humanity course to encourage students across the university to explore AI and automation from historical, ethical and public policy perspectives. 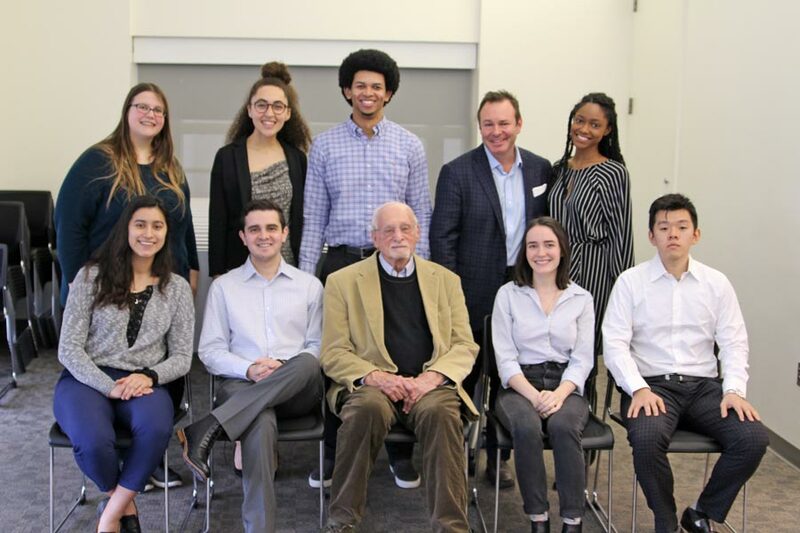 For their final project, student teams presented multidisciplinary analyses of the challenges and opportunities provided by current or near-future technology, as well as technology and/or policy recommendations to respond to their potential negative impacts. As part of their final projects, first-year students in the Artificial Intelligence and Humanity Grand Challenge Seminar created forward-looking narratives that explored keywords related to the course, such as “agency,” “inequality” and “surveillance.” Alexander Graf presented “Global Economic Outlook: 2050,” a fictitious World Economic Forum report set in 2050 that focused on features of the world economy. The class was taught by Jennifer Keating, assistant dean for educational initiatives in Dietrich College, and Illah Nourbakhsh, K&L Gates Professor of Ethics and Computational Technologies in the Robotics Institute.